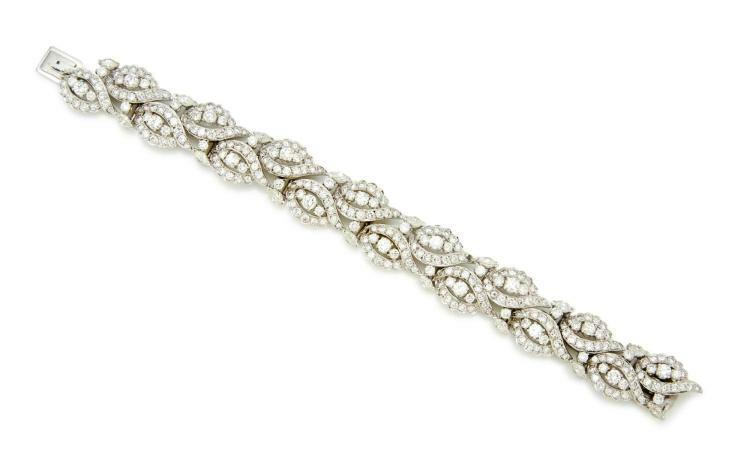 Description: Designed as a series of foliate motifs set with brilliant-cut and marquise diamonds, length approximately 170mm. Condition: Diamonds bright and lively, estimated total diamond weight approximately 16.00-18.00 carats, estimated clarity I-J, estimated clarity VS on average, as graded within the limitations of the mount. Links well articulated, some scratches to metal consistent with normal wear, clasp closes securely with additional safety catch. Width approximately 16mm, gross weight approximately 50.2 grams. In good condition. Please note Condition 11 of the Conditions of Business for Buyers (Online Only) is not applicable to this lot. For further information please contact the department on +44 (0)207 293 6409. As indicated in the Conditions of Business for Buyers (Online Only), the Online Sale Information for each Lot includes pre-sale estimates which are provided by Sotheby's as a guide for prospective Bidders to assist them with determining the appropriate amount to bid for a Lot. In our opinion, any bid for an amount which is between the high pre-sale estimate and the low pre-sale estimate stated in the Online Sale Information for the Lot would offer a chance of success. Having said that, it is important you appreciate that Lots can realize prices which are above or below the pre-sale estimates. It is advisable to check the pre-sale estimates prior to submission of a bid. Please note that the pre-sale estimates which are stated in the Online Sale Information do not include buyer's premium, any applicable VAT (or any amount in lieu of VAT) or any applicable ARR. The Online Sale Information includes a shipping costs calculator which has been developed by Sotheby's to enable you to estimate the amount it will cost you to have the Lot shipped to your delivery address (inclusive of VAT, associated packing and transit insurance costs) in the event that you are the successful Bidder so that you are able to account for this cost in your assessment of the appropriate amount to bid for a Lot. Please also note that the transit insurance price quoted by the shipping costs calculator shall not include the impact of any applicable ARR on the total purchase price payable in respect of a Lot by the Buyer. Please also note that the shipping cost which is generated by the shipping costs calculator may differ to the actual amount of the Buyer's Shipping Costs which is quoted to you in the Buyer's Shipping Quote (which shall include the amount of any applicable ARR payable in relation to the Lot). A Buyer's Premium is payable by the successful Bidder on a Lot in an Online Only Auction. The Buyer's Premium is added to the Hammer Price and is included as part of the total Purchase Price payable by the successful Bidder. In an Online Only Auction conducted by Sotheby's in London, the Buyer's Premium rate is as follows: 25% of the Hammer Price up to and including £180,000, 20% of any amount in excess of £180,000 up to and including £2,000,000 and 12.5% of any amount in excess of £2,000,000. Endangered Species: Items made of or incorporating plant or animal material, such as coral, crocodile, ivory, whalebone, tortoiseshell, etc., irrespective of age or value, may require a licence or certificate prior to exportation and require additional licences or certificates upon importation to any country outside the EU. Please note that the ability to obtain an export licence or certificate does not ensure the ability to obtain an import licence or certificate in another country, and vice versa. For example, it is illegal to import African elephant ivory into the US and there are other restrictions on the importation of ivory into the US under certain US regulations which are designed to protect wildlife conservation. ? Sotheby's suggests that buyers check with their own government regarding wildlife import requirements prior to placing a bid. It is the buyer's responsibility to obtain any export or import licences and/or certificates as well as any other required documentation (please refer to Condition 10 of the Conditions of Business for Buyers (Online Only). Please note that Sotheby's is not able to assist buyers with the shipment of any Lots containing ivory and/or other restricted materials into the US. A buyer's inability to export or import these Lots cannot justify a delay in payment or a sale's cancellation. The following paragraphs are intended to give general guidance to buyers on the VAT and certain other potential tax implications of purchasing property at Sotheby's. The information concerns the most usual circumstances and is not intended to be complete. In all cases the relevant tax legislation takes precedence and the VAT rates in effect on the date of the sale of a Lot in the Online Only Auction will be the rates charged except for Lots sold subject to Temporary Admission for which the applicable rate will be that in force at the date of release of the relevant Lot by Sotheby's. It should be noted that, for VAT purposes only, Sotheby's is not usually treated as an agent and most property is sold as if it is the property of Sotheby's. Where there is no VAT symbol, Sotheby's is able to use the Auctioneer's Margin Scheme and VAT will not normally be charged on the Hammer Price. Sotheby's must bear VAT on the Buyer's Premium and hence will charge an amount in lieu of VAT at the standard rate on this premium. This amount will form part of the Buyer's Premium on our invoice and will not be separately identified. A limited range of goods, including most books, are not liable to VAT?and therefore no amount in lieu of VAT will be added to the Buyer's Premium. Please see section 5 below ('Exports from the European Union') for the conditions to be fulfilled before the amount in lieu of VAT on the Buyer's Premium may be cancelled or refunded. VAT-registered buyers from within the European Union (EU) should note that the amount in lieu of VAT contained within the Buyer's Premium cannot be cancelled or refunded by Sotheby's or HM Revenue and Customs. These items will be sold under the normal UK VAT rules and VAT will be charged at the standard rate on both the hammer price and Buyer's Premium. You should also note that the appropriate rate will be that in force on the date of dispatch of the property from Sotheby's and not that in force at the closing date of the Online Only Auction. These lots will be invoiced under the margin scheme. Sotheby's must bear VAT on the Buyer's Premium and hence will charge an amount in lieu of VAT at the standard rate on this premium. This amount will form part of the Buyer's Premium on our invoice and will not be separately identified. On request, immediately after the closing date of the relevant Online Only Auction, the Temporary Admission Department can either ask HM Revenue and Customs to generate a C79 certificate (for UK buyers), or obtain a copy of the import C88 (for other EU VAT registered buyers), which may be used to claim recovery of the VAT. Otherwise Sotheby's may re-invoice the lot as if it had been sold with a 'SINGLE DAGGER' symbol and charge VAT at the standard rate on both the Hammer Price and Buyer's Premium and provide a tax invoice to the buyer. This may enable a buyer who is VAT registered elsewhere in the EU to avoid payment of VAT in the United Kingdom. Re-invoicing in this way may make the lot ineligible to be re-sold using the margin scheme. Property with no VAT symbol (see paragraph 1)?The amount in lieu of VAT charged on Buyer's Premium may be refunded provided the purchaser resides outside of the United Kingdom and the property is exported from the EU within 3 months of the sale. Sotheby's must be provided with the appropriate proof of export immediately after export of the goods. Property with a 'SINGLE DAGGER' symbol?The VAT charged upon the Hammer Price may be refunded provided the purchaser resides outside of the United Kingdom and the property is exported from the EU within 3 months of the closing date of the relevant Online Only Auction. Sotheby's must be provided with the appropriate proof of export immediately after export of the goods. (c) The Online Sale Information will also identify if the Seller is an Online Consumer (and therefore, by inference, not an Online Trader) for the purposes of the Consumer Contracts Regulations. This is important because the Consumer Contracts Regulations provide that if the Seller is an Online Trader and the Buyer is an Online Consumer, the Buyer shall have the right to cancel the purchase of a Lot (in accordance with the procedure set out at Condition 11 of these Condition of Business for Buyers (Online Only)). In circumstances where the Seller is an Online Consumer, the right to cancel the purchase of a Lot does not apply however the Buyer may have the right (under the Consumer Contracts Regulations) to cancel certain services provided by Sotheby's in connection with the purchase of the Lot (in accordance with the procedure set out at Condition 12 of these Conditions of Business for Buyers (Online Only)). (iv) any other duties, goods, sales or service tax or VAT. (c) Sotheby's charges a Buyer's Premium to the Buyer on the Hammer Price for each Lot sold. The amount of the Buyer's Premium is set out in the Guide to Buying in an Online Only Auction set out above. (d) The Buyer of a Lot is solely responsible for the payment of any VAT (including, but not limited to, any import VAT), sales tax or value added sales tax, sales or compensating use tax or any other similar tax payable as a result of the sale of a Lot. Further information and guidance as to the application of such taxes is provided in the Guide to Buying in an Online Only Auction set out above. (e) In certain countries, local laws entitle the artists or the artist's estate to the ARR when any Lot created by the artist is sold. If these laws apply to a Lot, the Buyer must pay Sotheby's an additional amount equal to the ARR (unless the local law requires payment to be made by the Seller). Further information and guidance on the application of the ARR is provided in the Guide to Buying in an Online Only Auction set out above. (f) Unless otherwise agreed, payment of the total amount specified on the purchase invoice for a Lot is due by the Buyer immediately following receipt of the Sotheby's invoice for the relevant purchased Lot and in any event no later than 48 hours after receipt of the Sotheby's receipt (the "Due Date") notwithstanding any requirements for export, import or other permits for such Lot. Sotheby's will only accept payment from the registered Bidder and we cannot change the Buyer's name on an invoice or reissue the invoice in a name which differs to the name of the registered Bidder. If you are registered to bid as a company, your company will need to pay for any purchases in the name of the company via an accepted payment method. Partial payment of a Lot, or payment across multiple credit cards for a single lot, is not permitted. Further information regarding accepted payment methods is set out in the Guide to Buying in an Online Only Auction set out above. (g) Title in a purchased Lot will not pass until Sotheby's has received the total amounts due for that Lot in accordance with Condition 8(b) above in cleared funds. Sotheby's is not obliged to release a Lot to the Buyer until title in the Lot has passed and appropriate identification has been provided, and any earlier release does not affect the passing of title or the Buyer's unconditional obligation to pay the total amounts due for that Lot in accordance with Condition 8(b) above. (h) Risk in and responsibility for the purchased Lot will transfer to the Buyer as follows: (i) if Sotheby's dispatches the Lot to the Buyer using the method of shipping specified for the Lot in the relevant Online Only Auction, when the Lot comes into the physical possession of the Buyer or a person identified by the Buyer to take physical possession of the Lot on the Buyer's behalf; or (ii) if collection by the Buyer in person is permitted for the relevant Online Only Auction, when the Buyer collects the Lot. As a Buyer, you acknowledge and agree that the Lot is at your risk if you choose to exercise any right you may have to cancel the contract for the purchase of the Lot (in accordance with the procedure set out at Condition 11 below) and that you should therefore ensure that you insure the Lot against loss or damage until it is returned to Sotheby's. (i) If you fail to pay us the total amounts due for the purchased Lot(s) in accordance with Condition 8(b) above in full by the Due Date, Sotheby's will be entitled to exercise any of the remedies identified at Condition 9 below. Please note that, should you wish to arrange your own shipping or to arrange collection of your purchases yourself, most lots are located at our New Bond Street office, the details of which are below. Please check with our Post Sales Services team (contact information below) for the Lot location before collecting. Please note that property can only be released once payment has been received and cleared. If you are using your own shipper to collect property from Sotheby's, please provide a letter of authorisation, a copy of your paid invoice and photographic ID or a completed release of liability form (provided by Sotheby's). Unfortunately, not all lots will be available for collection at New Bond Street, unless otherwise stated on your invoice. Please see the Conditions of Sale for our Online-Only sales for further details.